The population of the United States of America is becoming more diverse ethnically, racially, and linguistically (Hobbs, Stoops, & Long, 2002). The challenge this poses to faculty of teacher education programs is to edify teacher candidates who are prepared to teach children who might be from a culture other than their own. In this chapter, the author presents a curriculum design model and describes course implementation for exploration of the topic of culture with undergraduate early childhood teacher candidates in a foundations course. Through the course design the preservice teachers are offered an understanding of what is needed to develop the knowledge and skills to be a culturally competent teacher capable of developing a culturally responsive curriculum. The ethnic and racial diversity of the United States population has increased dramatically during the 20th century. From 1980 to 2000, the population who self-identify as Hispanic increased in size from 14.6 million to 22.4 million (Hobbs, Stoops, & Long, 2002). Now, in 21st century America, there is “a new generation of students far more diverse-by race, ethnicity, culture, and language-than our country has ever known” (Sadker & Zittleman, 2007, p. 43). Simultaneously, White teachers comprise 83.5% of teachers in the United States (National Center for Education Statistics, 2008). As noted by the National Education Association (NEA) President Dennis Van Roekel, educators possessing the knowledge, skills, and attitudes to value the diversity among students will contribute to an educational system that is designed to serve all students well. Preparing teacher candidates to offer a culturally inclusive curriculum for the diverse students in their future classrooms is a challenge college faculty encounter in teacher education programs (NEA, 2015). Many teachers are struggling to better serve students from cultures other than their own (National Education Association, 2015). Culturally sensitive teachers could be better equipped to plan a culturally responsive curriculum, which could provide a classroom environment that is welcoming to all children and their families. Being introduced to the topic of cultural diversity in their teacher education program allows preservice teachers to be primed to teach the student population they will likely encounter. 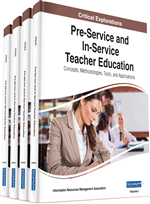 In this chapter the focus of the teacher candidates in the study being discussed, is students enrolled in an early childhood education program at an accredited four-year college. For young children to develop and learn optimally, early childhood professionals must be prepared to meet the different cultural, linguistic, developmental, and educational needs of students (National Association for the Education of Young Children Linguistic & Cultural Diversity, 1995). According to the National Association for the Education of Young Children (NAEYC) Professional Preparation Position Statement (2009) teacher candidates who are well-prepared possess knowledge and understanding of diverse family characteristics including home language, cultural values, and ethnicity, with knowledge of these and other factors creating a deeper understanding of young children’s lives. Through coursework and practical experience, preservice teachers will come to know and appreciate the cultural practices of the young children they teach. They will acquire the insight needed to be able to identify and apply culturally relevant curriculum plans for the students and their families. The chapter will begin with contextual terminology related to the topic of culture and an overview of accreditation for teacher education programs in the United States. The objective of this chapter is to present a teacher education pedagogical model which explored cultural components with teacher candidates to guide their development to become culturally responsive educators.